What’s Confit D’ Oignon? Why it’s French Onion Marmalade. Most marmalade’s or jams are sweet and made from various fruits. This marmalade has a savory, sweet and tart quality making it an excellent condiment for many things. I love putting up assorted foods ahead of time. There’s something special about pulling something from your pantry that you have canned yourself. Onion marmalade is very easy to make and believe me adds something unique to you repertoire. This makes an incredible holiday or hostess gift; not to mention surprising your friends and family with the unexpected. I enjoy making onion marmalade with red onions, but you can also make it with yellow or white; just make sure to change out the red wine and red wine vinegar for white vermouth and white wine vinegar. This can be canned or frozen depending on your preference. I prefer to can it so I can give it as a gift that I don’t have to worry about thawing. I strongly recommend that if you tackle this recipe, consider double or tripling it. The time is mostly spent reducing and cooking it down to syrupy deliciousness. It’s wonderful on beef or duck as a condiment. My favorite way is a slice of toasted or grilled baguette, topped with fresh chevre and then onion marmalade. Or try sauteed greens, feta, poached egg and top with a bit of the onion marmalade. Then there’s topping a circle of brie with onion marmalade, wrapping it in puff pastry, then bake. C’est bon! In a large heavy skillet over medium-high heat, add your olive oil and sliced onions. Toss them around to make sure they all have a coating of the oil. Reduce heat to medium and cook, covered until they start to color; about 10-15 minutes. Add the salt, pepper, bay leaves and rosemary. Cook, stirring occasionally, for 20-30 minutes, or until the herbs have become soft and wilted. Add the brown sugar, wine and wine vinegar. Bring to a boil, stirring constantly; then lower the heat to low and let simmer for 30-40 minutes (if you are doubling or tripling the recipe, this will take longer. In fact the more you make, the longer it will take to cook down; as long as a couple hours.) Remember patience is a virtue. Continue simmering on low until the liquid is dissolved and the onions are soft and sticky. Note: Stir frequently during this process so that the onions do not stick to the bottom of the pan from the sugar and become burnt. Remove the rosemary sprigs and bay leaves; discard. Let marmalade cool before serving or it you are refrigerating it for use within a week. Otherwise, keep it hot for your water bath canning. Can in sterilized 4 ounce or 1/2 pint mason jars, leaving 1/8 inch clearance. Can for 15 minutes. Until I moved to our vegetable farm I absolutely hated beets and avoided them at all costs. Yet here I am staring out at the drifted snow and frozen lake with a bowl of borscht in my hand. The smell alone is enough to make you swoon. I feel a sense of gratitude for learning to love the darn things. Our farm is committed to growing vegetables without chemicals (which can significantly alter their flavor) so when I tried them again I was surprised by their inherent sweetness. What was I thinking? They are one the best things you can eat; full of essential vitamins and minerals. They are low in calories and sodium along with assisting in the reduction of inflammation in the body. They also support heart, digestion and brain function. So what’s not to like? There’s nothing like a bowl of warm goodness to set you straight. Heat the olive oil in a soup kettle or Dutch oven on medium high heat. 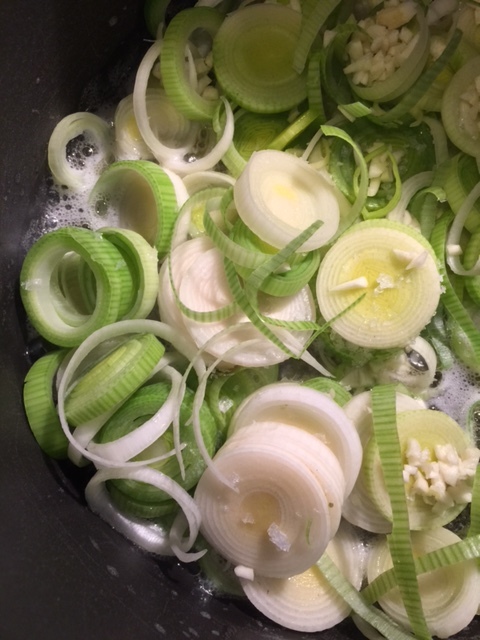 Add leek, garlic and red onion. Saute until soft and translucent. Add sweet potato, beets and grated carrot. Cook for 5 minutes stirring frequently. Add red cabbage, dill and vegetable stock. Bring to a boil and reduce heat to medium. Simmer for 30 minutes or until beets are soft when a paring knife is inserted. Add red wine vinegar off heat. Serve in bowls topped with a dollop of yogurt if using and sprinkle additional fresh chopped dill on top. Spring seems to be dragging its feet around here. One day it’s warm, the next day it’s cool, while the night’s plunge into the low 40’s and occasionally the 30’s. It looks like our tomato planting is put off another week. Those 2600 little darlings will just have to wait it out in the hoop house until the night temperatures warm up. The good news is that the rain and warm daytime temperatures are wonderful for glorious spring asparagus! Do I see a pattern here? Wasn’t I just making a pronouncement last week that it’s one of the few vegetables I will only use fresh? Well, that was last week. We bought 10 pounds to put up, taking full advantage of fresh Michigan asparagus while it’s plentiful now; and boy is it ever! Nearly every stall at the farmer’s market is overflowing with the stuff. I know that we will be reminded of our favorite veggie in this wonderful cream soup long after the season is over. 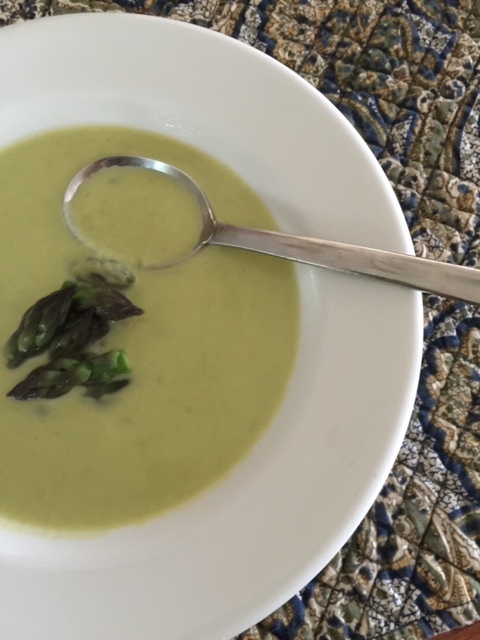 There are many approaches to asparagus soup, but typically the essentials involve asparagus, onions or leeks and chicken stock. With spring leeks available, that choice was a no-brainer. However the addition of garlic, fresh spring tarragon and vermouth kick it up a notch. And of course there’s the cream. Honestly, it’s decadence is worth the calories! Snap off the tough stem ends from the asparagus spears. Cut the tips off a dozen or so and set aside for garnish. Chop the remaining asparagus into 1 inch pieces. 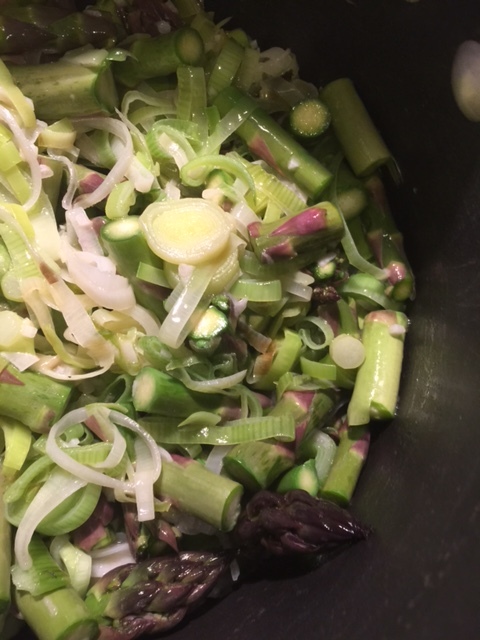 In a small saucepan, blanch the asparagus tips for 2 minutes, then plunge into ice water. Let drain on paper towels. Reserve for later. In a heavy soup pot over medium heat, melt the butter. Add the leeks and garlic and saute until tender and translucent, about 3-4 minutes. Add the asparagus and 4 cups of chicken stock. Season with salt and freshly ground black pepper. Bring to a simmer, then reduce the heat to medium-low. Add the chopped tarragon. Cover and cook for about 20 minutes. Using an immersion blender, puree the soup until smooth, about 2 minutes. Alternately, you can puree the soup in batches in a blender, then return to the pot. Add lemon juice and heavy cream. Reheat the soup to serving temperature. Ladle in shallow bowls and garnish with reserved asparagus tips. Tip: This soup is also great cold, so pack it for your next lunch if you’re luck enough to have leftovers. Spring never tasted so decadent.